Western Pride delivered Brisbane Roar Youth their second loss in a row following a 4-2 win at Briggs Road Complex on Saturday. Todd Norris, Joe Duckworth, Neilen Brown and Harrison Sawyer shared the spoils for the hosts in front of goal for only Pride's second win since April. Young Roar’s goals came courtesy of Dane Ingham and Daniel Leck either side of half-time - marking the first PlayStation 4 NPL Queensland senior goals for both players. Entering the match under the guidance of interim coach Karla Reuter, Pride started positively with an early chance from Norris deflecting wide. However, Norris found the back of the net only minutes later to open the scoring for the hosts - his fourth goal since joining the club in May. Duckworth doubled the advantage on the quarter hour with a simple tap-in when Sawyer squared after luring out Young Roar goalkeeper Denver Crickmore on the burst. Sawyer forced a save from Crickmore with a header shortly after before Young Roar tested Pride goalkeeper Bon Scott with a free-kick on the half-hour. 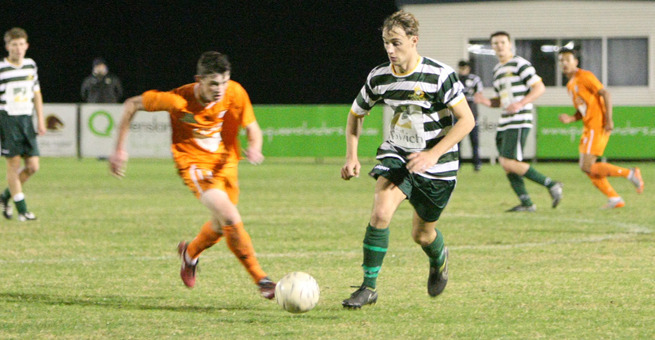 The visitors halved the advantage when Scott misjudged an advance gifting Ingham a goal in his first senior PlayStation 4 NPL Queensland start. However, Brown restored the host’s breathing space in the final minute of the half on the counter attack with Sawyer again delivering the final pass to enable a simple finish. Young Roar created a pair of chances after the restart before again pulling to within a goal after a series of cultured passes set-up Leck for the finish. The sides continued to exchange chances in an increasing open match as Sawyer and Young Roar’s Samuel Sibatuara both called upon the goalkeepers. Pride substitute Majok Piok made his debut off the bench and impressed immediately - almost finding the head of Sawyer with a cross before seeing his shot smothered by Crickmore. A tense finish seemed inevitable before Sawyer sealed the win in time added on - the Pride attacker displaying his mix of pace and composure to slot the finish on the counter for his fifth goal of the campaign. The result exacts revenge for Pride after Young Roar defeated the Ipswich-based club by 12 goals in their meeting earlier this season. Speaking post-match, Reuter said the result was a product of Pride playing their game and not being dictated to by the opposition. “They really wanted that tonight and I guess in a sense they had a point to prove after our spanking of twelve-nil against those guys last time,” she said. Young Roar coach John Sime said his side were repeatedly caught on the transition by Pride. “I was disappointed with some individual performances from experienced players more than the younger players but younger players make mistakes and you just have to cop it on the chin and progress from there onwards,” he said.